The ocean is a vast and scary place for little ones, but Granny Grommet and her granny friends show the way to discovering its wonders in safety. While never discounting the reasons for fearing water, Granny Grommet and her pals revel in the roar and excitement of catching a wave and explore the beauty hidden beneath the water’s surface on calmer days. 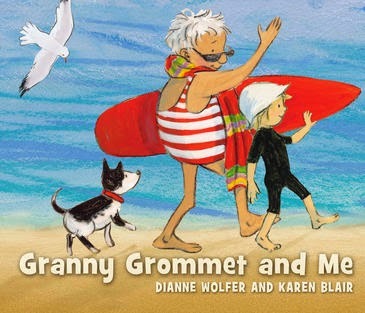 Ever so gently, Granny Grommet and Me reveals the fun to be had at the beach while showing how to do so safely. Each double page spread is a textured painting depicting the vastness and beauty of the beach. I would happily frame and hang them all, thus bringing a little of the joy and colour of the seaside into my home. Granny Grommet and Me is a keeper: one I’ll be sharing with anyone who loves sunny days, especially if they are a little bit nervous around water. Shortlisted for the 2014 CBCA Books for Early Childhood Award.